A beautiful example of a bedroom painting celebrating the virtue of chastity, the supreme female virtue of the Renaissance, is a panel by Neroccio de’ Landi that depicts Claudia Quinta. She is identified in the inscription on her pedestal as CLAVDIA CASTA (Claudia the Chaste). This classical heroine was closely associated with Cybele, the Roman goddess of fertility, chastity, and virtue, after miraculously helping to bring into Rome a ship bearing a golden statue of the goddess. Claudia Quinta, dressed in high fashion, her long golden tresses covered by a light, gauzy veil, wears a costume that combines classical dress with such details as the elaborated sleeves of contemporary Florentine costume. The elegant figure, looking earnestly out at the viewer, presents herself as an exemplary symbol of both female virtue and beauty. The miniature ship she holds in her right hand, with a tiny standing figure in gold, alludes to her exploits in bringing the ship of Cybele into safe harbor. Panels depicting Temperance and Prudence, c. 1500, also appear to have been part of the interior decoration of a fifteenth-century palace. They provide a more general and traditional testimonial to the virtues of the palace’s inhabitants. Temperance holds a vase filled with wine that is being poured into a mixing bowl to be diluted with water; Prudence holds an elaborately decorated mirror in her right hand and a staff of command, with which she tames the dragon at her feet, in her left. Heraldic shields are another category of objects that might be placed in the bedroom. A fine example is the shield by Andrea del Castagno, elaborately painted with the image of the biblical hero David. This type of shield, with allusions to battle, would be carried in civic processions and then housed in the bedroom chamber. The youthful David has been victorious in battle against the giant Goliath, whose decapitated head lies at his feet. 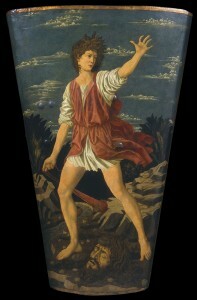 David is shown with his hand raised in a gesture that speaks of determination and self-possession and may have been taken from an antique model. In fifteenth-century Florence the Old Testament hero David had become an emblem of the strength and determination of the young Republic. A figure such as this, combining references of personal and civic valor, and painted by a highly esteemed artist of the period, would have underscored the owner’s readiness to do battle on both a metaphorical and an actual level, testifying to his civic and personal virtues. The concept of fertility and continuation of lineage also played an important role in bedroom decorations. 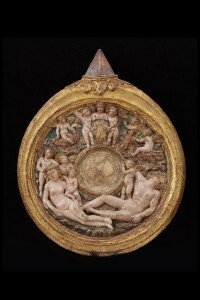 An elaborate frame of c. 1470 for a mirror—the center roundel, probably of blown glass or polished steel, is no longer extant—serves as a celebration of love within a specific family context. The reclining couple at the bottom of the frame provides the base for an animated group of cavorting putti. The outer frame of the mirror consists of a ring with a large gem at the top, recalling the device of the diamond ring used by Piero de’ Medici and later adopted by other members of the Medici family. The now blank shield presented by putti at the top of the roundel may have originally carried Medici arms. Gleaming with gold and filled with animated figures, this mirror is the type of functional and decorative object that carried a meaningful message and was ideal for bedroom embellishment.